A new mission of ocean exploration is in the works—but this one isn't bound for any place on Earth. It's a NASA spacecraft destined for a voyage to Jupiter's icy moon, Europa, which, though only the size of our own moon, may harbor an ocean twice the size of Earth's. In the late 1970's and early 1990's, NASA's Voyager and Galileo spacecraft returned tantalizing images of Europa--pictures that revealed a smooth, icy crust scored with cracks reminiscent of those in sheets of floating sea ice on Earth. These observations led to the exciting speculation that a vast ocean of liquid water lay hidden under a floating crust of ice. The presence of a body of water five times farther from the sun than the Earth has made Europa one of the most intriguing objects in the solar system, and probably the most likely place for finding some form of life beyond the Earth. The speculation even found its way into fiction, in Arthur C. Clarke's "2010: Odyssey 2," with some form of animate photosynthetic tendrils reaching out from a crack in the ice to pull a doomed spacecraft—and most of its crew—into the dark depths below. NASA's new mission to Europa, to be launched in the 2020s, will seek to confirm the existence of Europa's exo-ocean and assess its suitability as a potential life-friendly environment. Recently, NASA moved a step closer to realizing this expedition when it selected nine proposed instruments that will form the science payload of the spacecraft. The spacecraft will orbit Jupiter in a long, looping orbit that will carry it past Europa on as many as 45 flybys at distances from its surface ranging from 1,700 miles to an ice-scraping 16 miles. During the flybys, it will subject Europa to a barrage of analysis aimed at revealing as much about Europa and its subsurface structure and composition as possible. High-resolution imagery will probe the composition of Europa's surface, make a detailed study of cracks and other features between shifting ice plates, and search for the source of water vapor plumes observed by the Hubble Space Telescope in 2012—which, if they do exist, and are supplied by the ocean deep below, may serve as a "tap" to sample directly the composition of that ocean. 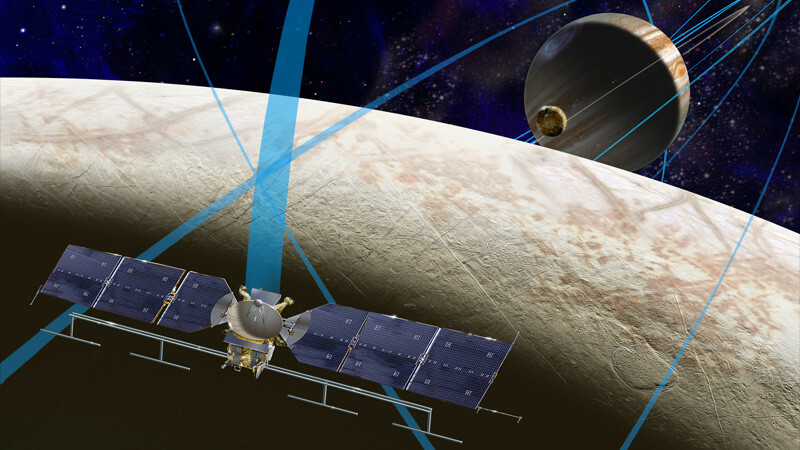 An infrared camera will look for eruptions of warmer water, while other instruments will sniff for gases and small particles in Europa's tenuous atmosphere that may have been exuded from the subsurface ocean through plume eruptions. 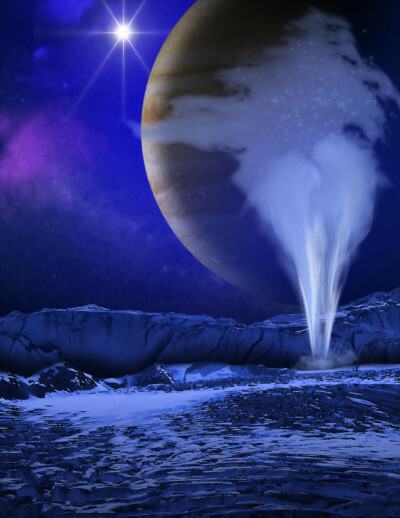 Ice-penetrating radar will look under Europa's skin and determine the thickness of its crust of ice. 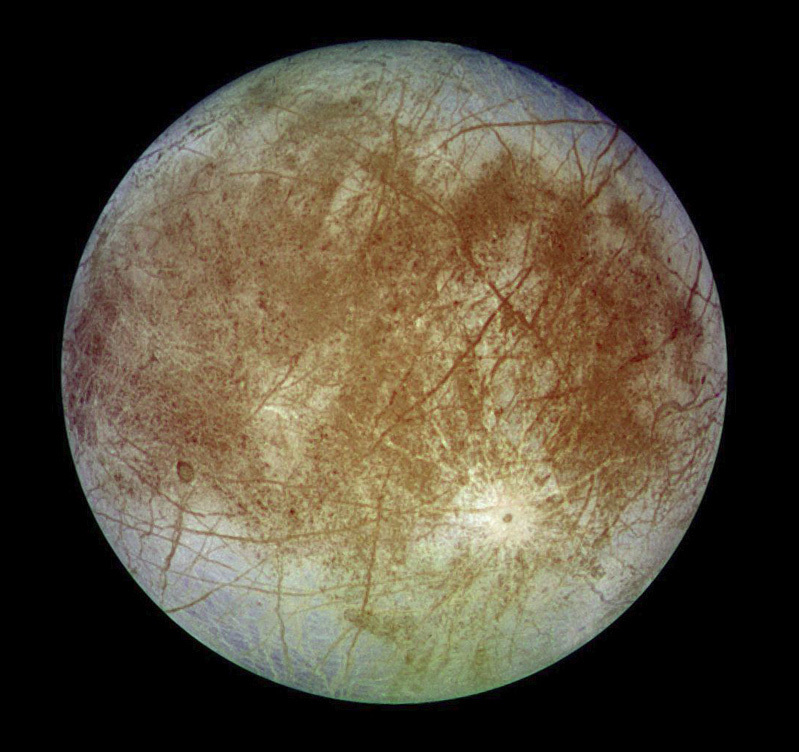 A magnetometer will measure Europa's magnetic field in an effort to determine the salinity and the depth of the ocean. Past observations of Europa, like the snapshots taken by Voyager and Galileo, could merely show us Europa's surface appearance, leaving us only to speculate on what was going on deep below. Close-up images taken by Galileo display patterns that pique the imagination, giving one impressions of things like ice fans on the surface of a frozen pond, glaciers, Antarctic ice sheets, and ski trails on a snowy slope. NASA's new Europa mission will be more like a full-body scan than a snapshot, giving us a look under the icy crust, and maybe to the bottom of its deep ocean. We can yet only imagine what may exist down there—hydrothermal vents, organic compounds, microbial life, jellyfish?—but this next phase of exploration promises some awesome moments of discovery.